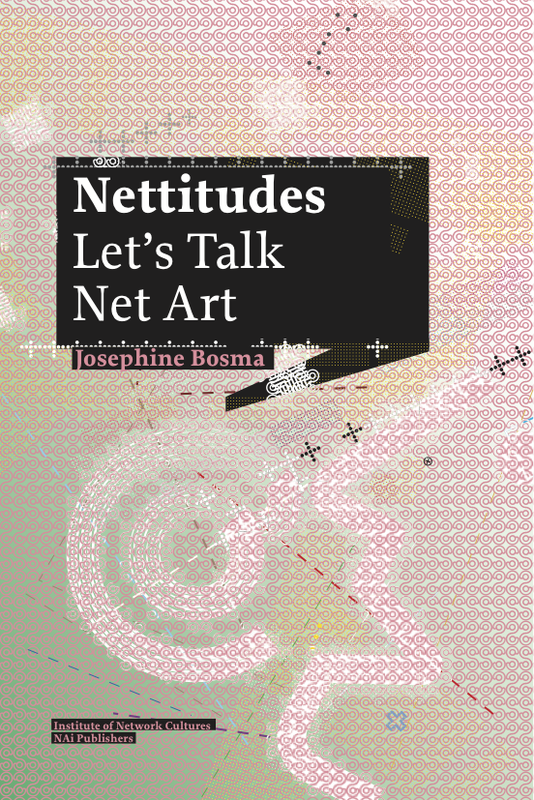 Nettitudes, the new book by Josephine Bosma, is an important contribution to the often confusing and unbalanced discussion about the Internet and contemporary art. This contribution becomes especially clear from what the book does not do. First of all, Bosma does not try to offer a historical overview of the phenomenon that she calls ‘net art’. She also indicates clearly why it is difficult to mark out this area unequivocally, for there are widely differing views as to how the interaction between the Internet and contemporary art should be interpreted. Indeed, net art must in the first place be seen in a broader context than that of contemporary art, because the development of this ‘genre’ cannot be seen separately from the various forms of network culture with which it sometimes partly converges or by which it is influenced. Moreover, Bosma does not wish to call net art a discipline or movement, as the entire terrain is too diverse and heterogeneous for that, and also has too much of a cross-disciplinary character. Nor is it a good idea to have net art purely coincide with the medium of the Internet, which itself can hardly be described. When the same problem is approached from an art theoretical point of view, limiting net art to a particular medium is also absolutely absurd. Bosma herself refers to Rosalind Krauss, the American art theorist, who in her famous essay ‘Sculpture in the Expanded Field’ argued that contemporary art has wrested itself from the yoke of the medium ˆ it has entered an ‘expanded field’ in which every material or medium can be appropriated, but to which the ‘work’ can never be reduced. That does not mean that the medium as a category can simply be shoved aside. This would lead to a simplistic dichotomy between conceptualism versus materialism ˆ a false contradiction, according to Bosma, which would only work counter-productively in trying to better understand the phenomenon she investigates. What is of primary importance for most of the works that fall under the term ‘net art’ is a good understanding of the network culture from which they spring: the interactions that artists have online with one another and with the public. Bosma furthermore points out that net art does not only refer to art that takes place in one way or another on the Internet and on the screen. It can also concern work that is directly inspired by the new realities that the Internet and online cultures create, but whose manifestation takes place entirely off-line, separately from the Internet. Therefore, the definition she uses to describe net art reads in its shortest form as: art that is rooted in or based on Internet cultures. This way, she prevents an arbitrary broadening of the concept, for only works which cannot be seen separately from the cultures that have developed around the Internet can legitimately be considered net art. With this definition, it is clear that the phenomenology, logic and structure of the Internet cannot be bypassed when coming up with an adequate description of net art. No more than can net art be reduced to a technological genre. According to Bosma, it is hard to give a good description of this heterogeneous and cross-disciplinary field and introduce some structure into the discussion, but not impossible. In order to get a grasp of the material, she introduces five key concepts by which the vast majority of the works that she calls net art can be understood: Code / Flow / Screen / Matter / Context. She uses ‘Code’ to look at work that primarily is aimed at the technical infrastructure and software that form the underpinnings of the Internet. This is the most abstract category, accounting for the fact that the Internet in fact rests upon a series of agreements set down in technical protocols. The fact that interesting artistic experiments are being carried out in precisely this inaccessible area indicates the depth of the artistic research behind those experiments. Bosma unlocks this hermetic area with a clear description of the classical project ‘Web Stalker’ by the British artist collective I/O/D. ‘Flow’ refers to the remote connections that are made through the Internet, with the emphasis on live performance and network installation art. While distance and spatial relations do not vanish in the digital network, the spatial logic and the forms of exchange (image, sound, information) that can take place in the new spatial configurations do change radically. These processes are manifested by the performative aspect, particularly live performance. ‘Screen’ refers to the complex (technological) processes behind the fragile visual form of net art works. In these works, the semblance of a stable image is often undermined by the underlying process. Interaction with this type of work makes the viewer aware of the capacity of endless transformation that characterizes the digital image. ‘Matter’ investigates the role that the hardware, the physical machinery behind the ‘immaterial’ network, plays in net art ˆ sometimes by literally putting these machines on stage, sometimes also by presenting absurd or faulty machinery. Finally, ‘Context’ is about the social and political context in which a certain category of net art works chooses an articulated position. Particularly this category of works been given a lot of attention by critics over the course of the years, but according to Bosma it is by no means representative of the entire field of net art. Nettitudes is divided into two sections. The first section frameworks the discussion on net art, gives definitions and discusses the positions of other theorists and art critics, such as Tilman Baumgärtel, Julian Stallabras and Rachel Green. Here, Bosma also introduces the concepts mentioned above in order to provide some structure and orientation for the discussion on net art. In the second section, she examines the various positions taken by artists and movements in network culture over the years. Then she goes into the thorny debate on the conservation of net art works. The book closes with a chapter on Internet-related sound art, a form that adds an ‘intimate’ dimension of its own to net art. Nettitudes is a breath of fresh air. An important and underexposed artistic genre is finally getting the serious attention it deserves. Nettitudes also offers a useful analysis for the further development of a critical and sound substantive ‘discourse’ on the exchange between the Internet and the production and reception of contemporary art. Originally written for: Open #22 – “Transparency. Publicity and Secrecy in the Age of WikiLeaks”, Journal for Art and the Public Domain, Amsterdam, 2011.